Home baking soda benefits of baking soda egg health health news useful ADD SOME BAKING SODA WHEN BOILING EGGS – THE REASON WHY IS INCREDIBLE! Every problem has a simple solution, and this also applies for boiling eggs. It may be a tricky process, but the tricks we’re going to show you today will help you save time and boil your eggs perfectly. According to experts, eggs aged 7-10 days are ideal for boiling and are easiest to peel. You have probably noticed how some eggs are difficult while others are easier to peel. If you’re having problems peeling boiled eggs, all you need to do is add a teaspoon of baking soda in the process. Older eggs are more alkaline and easier to peel, while fresh eggs can be harder to peel. Baking soda will increase the eggs’ alkalinity, and you’ll have no problems peeling them afterwards. If you aren’t sure how old the eggs are, try this trick – put them in a bowl of water and observe: if they fall to the bottom horizontally, they’re fresh. If they fall to the bottom while standing upright, they are ideal for boiling. Eggs that float on the top are too old. 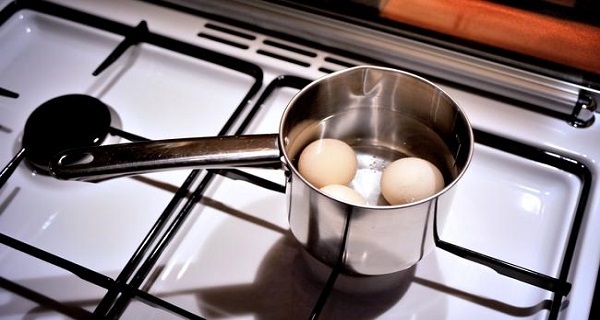 Heating the eggs first before boiling them is a great trick against cracks. You should either leave them on room temperature for a couple of hours, or put them under hot running water for a few minutes before boiling. The extreme temperature change is the main cause of cracks in the eggshells. If you want to get hard boiled eggs, you should leave them in cold water before boiling, which will reduce the risk of cracks. If you want your eggs to be softer on the inside, submerge them in boiling water by using a spoon and measure the time – depending on the size of the egg, you’ll need about 3 minutes. Also, make sure that the eggs are completely under water when you’re boiling them or they won’t be cooked properly. If you over boil them, the yolk will be greenish, while the egg white will become rubbery.